Similar to the handmade custom wedding mugs I make for couples all over the world, this extra special Father of the Bride Mug will be loved by all. Each mug is made on my potters wheel. The handles are hand pulled and added to the mug along with the name plate then glazed and fired a second time at over 2200 degrees which leaves the piece with a beautiful finish that will last for years. 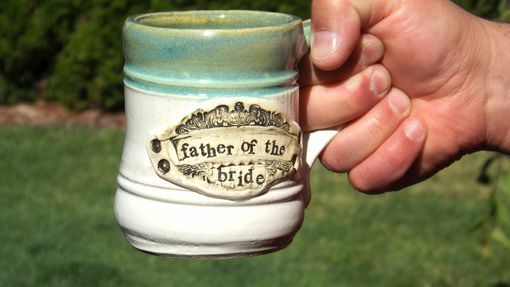 Standard Mug color: The mug in the photos have been glazed in Warm Jade with a creamy White exterior. All work is done with non-toxic materials suitable for the microwave and dishwasher, however I always recommend hand washing for gentler care. 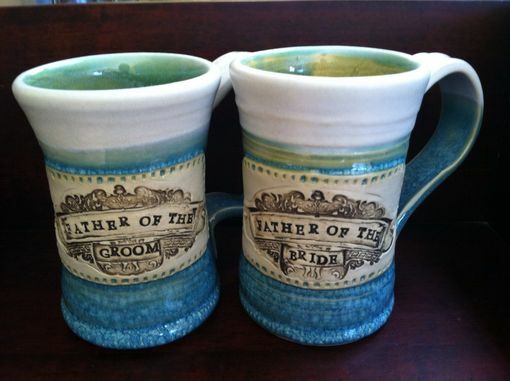 I currently have a Father of the Bride and a Father of the Groom ready to ship. Blue rim and interior/white exterior. 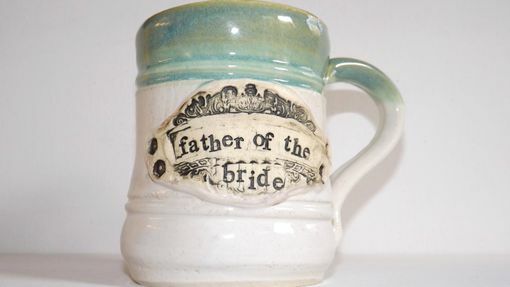 Each mug may vary in shape and size but will be finished as shown in the photo. All shipping is done via USPS priority 2-3 day and will have a tracking number.